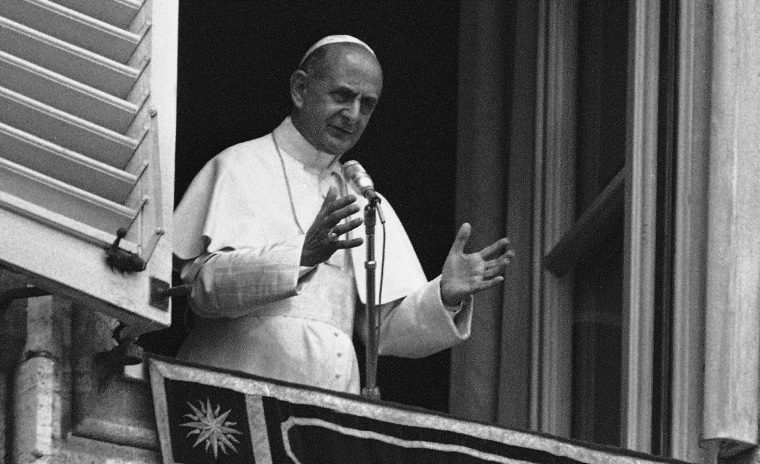 VATICAN CITY — The late Pope Paul VI, who led the Roman Catholic Church during one of its most turbulent modern periods, will move a step closer to sainthood in October, the Vatican said on Saturday. Pope Francis, who last month declared saints of two of his predecessors, will beatify Paul, declaring him a "blessed" of the Church, at a ceremony on October 19. The timing of the ceremony, means Francis will have either canonized or beatified three of his predecessors in the unusually short space of six months. The late pope's move towards canonization was made possible after the Vatican recognized what it says was a miracle attributed to Paul, who died in 1978. The purported miracle concerns a pregnant woman in California whose unborn child was discovered to be at high risk of dying in the womb or being born with severe birth defects in the 1990s. The woman prayed to the late Pope Paul. The child, now an adult, was born without problems. A Vatican medical committee ruled that the healing was medically inexplicable. Paul became pope in 1963 after the death of Pope John XXIII. He guided the Church through the conclusion of the Second Vatican Council, which had started under his predecessor, and the implementation of its modernizing reforms. After the beatification, a separate miracle would be necessary in order for Paul to become a saint. Last month Pope Francis presided at the canonization of two of his predecessors, John Paul II and John XXIII.